A Delta staff report suggests the proposed mall development (being developed by the Tsawwassen First Nations) would be equivalent to “all three floors of Metrotown or six times larger than Richmond Centre,” and would result in an additional 700 daily vehicles heading through the George Massey Tunnel by 2031. Clearly an unacceptable consequence, justifying study, reports, recommendations, actions, revisions of the transportation plan, perhaps the regional growth plan – and ultimately the capital plans that authorize the hundreds of millions of dollars needed. I’ve noted before – in Puzzle Picture – the difference in how we perceive, much less assess, what our transportation priorities should be. In the case of the Port Mann Bridge, delay of drivers was a cost that justified the billions spent on the widest bridge in the world. In the case of TransLink, an audit recommended a reduction of service. In one case, reducing delay is an investment; in the other, inducing delay is an efficiency. That’s the gap between motordom and transit. In the case of the Massey tunnel, congestion assumed by 700 more cars two decades from now is sufficient to start a process to address it. Two heavy-weight regional leaders – the mayor of our largest city, the president of our largest university – are making the economic case for Broadway rapid-transit. And noting the already overloaded demands on the existing system: 2,000 pass-ups now, with an anticipated increase of 150,000 new users by 2040. Compared to 700 more cars two decades from now. Do you recall a demand by the Premier for an audit of the Ministry of Transportation to see whether they were spending existing resources efficiently? Or auditors suggesting that there was sufficient capacity on our roads if only “service was optimized”? Or that the mayors of the region first had to determine their most important highway project? Or that a new tax or increase would have to be first identified, with broad public support and no negative effects on the economy? Of course not. It was just assumed the need was there because of traffic congestion, and the money would follow. The imperative was speed, for both process and politics. The gap between business as usual – i.e., Motordom – and our outstanding needs with the most positive outcomes – i.e. transit – has become grotesque. And, for illustration purposes, only one page apart. 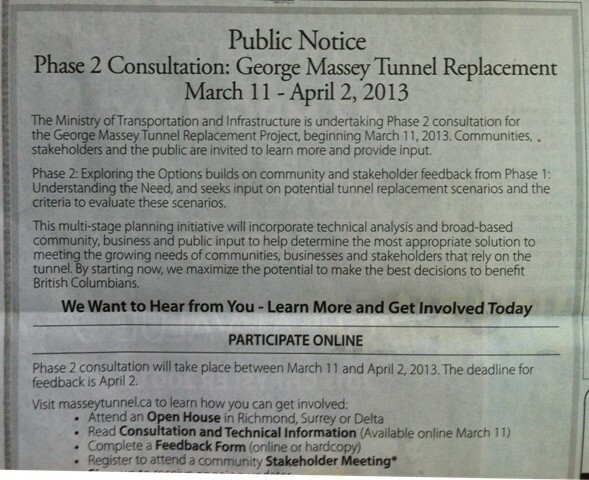 You can bet dollars to donuts the George Massey tunnel replacement will have a toll to fund it’s construction. It’ll have a toll, most likely, but the idea that the toll will fully fund its cost is laughable. whoopde doo. 700 cars daily? You don’t say. Don’t more vehicles travel on most local streets? There are more bikes daily going through some Bike to Work Week stations than this 700 vehicles per day. I think the real issue is that the proposed mall development is perceived as something that would increase traffic by 700 vehicles per day going to TFN land. This may be wishful thinking, as online shopping and cross border shopping increases. Hopefully the proposed mall if ever built can have a second life as a community college or school. Development of the mall site has already commenced. Don’t know about the mall itself. The other issue here are “civilians” / fellow citizens being encouraged to make green choices and stay off the road to make more room for intermodal freight trucks (right choice or not), while not being provided with the infrastructure to make the switch. It raises the question who government should be serving…the “economy” or citizens? We may have lost the balance some time ago. It coud still take time, but you have aso to question how reasonnable it is to live 40km away of your work and expect the governement subsidize your commute. Yes, let’s build an unreasonably huge mall in an unpopulated corner of the region far from transit and then use unlikely projections of its success to justify yet more freeway expansion. Who’s in charge here ??!? Anyways, using the divide and conquer technique, it’s not only dividing regions, with the new studies coming out and the reports by translink, there’s another division: LRT vs RRT. So while transit advocates argue on almost each metro vancouver blog, and hidden under all the scandals and politics, I guess the province believes it can slip the massey tunnel through. Which ignorant Vancouverite would not support building the world’s widest Bridge or be emotionally attached to the daily horror stories of tunnel commuting? Fingers Crossed Metro Vancouverites are smarter than that. At the Vision Vancouver Broadway Rapid Transit town hall meeting at St. James Community Hall on Sunday, March 10, Mayor Gregor Robertson was making a point about how the provincial and federal governments had made big investments in other regions recently, and now it was high time that it was Vancouver’s turn. I noticed the two projects that he mentioned were the Sea to Sky highway upgrade, and the Kicking Horse Pass Highway 1 upgrade. Two projects that kind of serve special interests, and I bet are not too popular with Vancouverites in general, and Vision supporters in particular. He did mention the Evergreen Line, the Canada Line and the Port Mann Bridge project at certain points during the event, but not in that context. I suppose that is because those projects are more popular, and/or successful, and would not have the same effect for the point he was trying to make.